Geneva – IOM, the UN Migration Agency, reports that 86,436 migrants and refugees entered Europe by sea in 2018 through 7 October, with 39,445 to Spain, the leading destination this year. In fact, since late September’s arrivals were reported, Spain in 2018 has now received via the Mediterranean more irregular migrants than it did throughout all the years 2015, 2016 and 2017 combined. The region’s total arrivals through the recent weekend compare with 140,272 arrivals across the region through the same period last year, and 318,207 at this point in 2016. Spain, with 46 per cent of all arrivals through the year, continues to receive seaborne migrants in October at a volume nearly twice that of Greece and more than seven times that of Italy (see chart below). Italy’s arrivals through late September are the lowest recorded at this point – the end of a normally busy summer sailing season – in almost five years. Last year in October migrants crossed from North Africa to Italy at a rate of nearly 1,500 per week – or about five times this year’s rate. Two Octobers ago, the numbers were even higher: almost 4,000 per week. In 2016, through June to October, the average number of rescues among sea-borne arrivals of migrants to Italy each month surpassed the number that has arrived in all of 2018 (see chart below). IOM Rome’s Flavio Di Giacomo on Monday reported that Italy’s 21,313 arrivals of irregular migrants by sea this year include many who arrive from departure points other than Libya. He noted that according to data gathered by IOM staff at disembarkation points, almost 150 migrants from Tunisia arrived by sea in Lampedusa between Friday and Sunday and explained that at present, almost all the flows arriving in Italy since early September came from the Tunisian route. “Tunisian arrivals so far this year are 4,742 and represent the first place among all nationalities,” Di Giacomo said. He said last year and in 2016 similar numbers of arrivals from Tunisia were reported, but those would have hardly entered the list of the top ten nationalities to Italy, overwhelmed by those from Eritrea, Nigeria and many of the Sub-Saharan migrants who arrived via Libya. Di Giacomo noted that deaths at sea continue to occur most frequently on the Mediterranean in the waters linking North Africa and Sicily, with 1,267 recorded through 7 October. IOM’s Missing Migrants Project (MMP) has documented the deaths of 1,783 people on the Mediterranean in 2018. Most recently, a 23-year-old Tunisian man drowned in a shipwreck off the coast of Djerba on 7 October. Five people were rescued and another five remain missing, according to survivors’ testimonies. More than 1,200 people have lost their lives while trying to cross the Central Mediterranean to Europe since the beginning of the year. In the Western Mediterranean, four more bodies were retrieved following the shipwreck of 1 October, which cost the lives of 34 people. Fifteen bodies have been brought to Hassani Hospital in Nador, while 19 people remain missing. In Dar El Kebdani, near Nador, a man died after falling down a steep slope while evading authorities on 2 October. Some 36 other migrants who were part of the same group were apprehended. 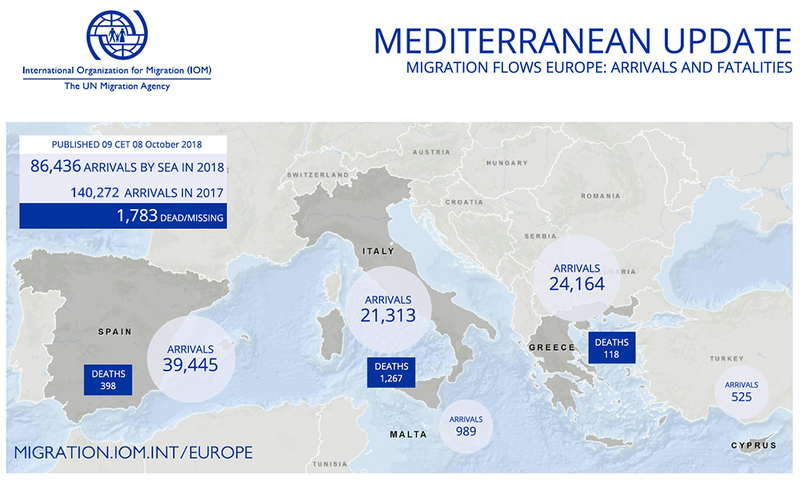 IOM Spain’s Ana Dodevska reported Monday that total arrivals at sea in 2018 have reached 39,445 men, women and children who have been rescued in Western Mediterranean waters through 23 September (see chart below). Arrivals in October are running at a rate of almost 300 per day, including nearly 1,200 migrants reported rescued over this past weekend. Dimitrios Tsagalas of IOM Cyprus reported Monday that on Friday (05 October) three men, believed to be Syrian nationals, crossed into the Republic of Cyprus through the Ledra Palace checkpoint. Monday morning (08 October) 21 people, all Syrian, were traced by the Cyprus Coast Guard at Cape Greco in the Famagusta area, on an unmanned vessel. A search and rescue operation took place and these irregular migrants and refugees–ten male, 2 female, 9 children – were brought safely to the port at Larnaca and were transferred to Pournara Temporary Accommodation Centre. Tsagalas said with those latest arrivals the total number of irregular migrants arriving in 2018 to Cyprus now is 525. IOM Greece’s Antigoni Avgeropoulou reported on Monday (08 October) that from Thursday through Sunday (04-07 October), the Hellenic Coast Guard (HCG) informed the United Nations Migration Agency it was involved in at least eight incidents requiring search and rescue operations off the islands of Lesvos, Samos and Chios. The HCG rescued a total of 340 migrants and transferred them to those three islands. Additional arrivals of some 264 individuals to Kos, Symi, Rhodes and some of the previously mentioned islands over these past four days brings to 24,164 the total number of arrivals by sea to Greece through 7 October (see chart below). Sea arrivals to Greece this year by irregular migrants appeared to have peaked in daily volume in April, when they averaged at around 100 per day. That volume dipped through the following three months then picked up again in August and again in September – 2018’s second busiest month with 3,955 (or just over 130 per day) just below April’s total of 3,975. Land border crossing also surged in April (to nearly 4,000 arrivals) but have since fallen back, with fewer than 2,000 crossings in each of the past four months (see charts below). IOM’s Christine Nikolaidou also shared data on Monday on the 19,382 irregular migrants detected by the Hellenic Coast Guard entering Greece via sea in 2018, through the end of August. The biggest single group, by nationality, is Syrian, with 6,099 men, women and children, or nearly one of every three arrivals. Next were Iraqis (4,006) followed by Afghans (3,716). Other large sender countries or areas include the Palestinian Territories (692), the Democratic Republic of the Congo (521), the Islamic Republic of Iran (334) and Pakistan (229). There are also some surprises: from Cameroon, a country where political strife has been reported lately, some 721 irregular migrants have arrived, almost 600 of those since the end of March. From Algeria, nearly 200 (199) nationals have been detected, as well as 52 from Sierra Leone, nine from the Dominican Republic and eight from Haiti. IOM’s Missing Migrants Project estimates that at least 2,806 people died or went missing on migratory routes across the globe in 2018 (see chart below). In addition to the devastating death toll in the Mediterranean, 302 migrants are known to have died on the US-Mexico border, compared with 278 in 2017. These include 62 people who have drowned in the Río Bravo in the first nine months of 2018. Most recently, the body of a man was found by US Border Patrol officers on the banks of the Río Bravo, near El Indio, Texas on 30 September. In Europe, a 22-year-old Pakistani man was found dead in a forest in Siva Reka, Bulgaria, near the border with Greece.